My name is Charles D. Levy and I am a heart surgeon at the Great Ormond Street Hospital, which cares for sick children. I am at the farther end of middle-aged and would say that my figure is comfortable but fit enough. Beyond these most rudimentary details I would struggle to describe myself – either my appearance or my personality – in the present tense, so let me tell you briefly what I was like before the events which I am about to relate occurred. I was a principled, respected and though I say it myself, successful man. I was brought up in an ordinary lower-middle class household by parents who encouraged me but could afford me no special privileges. I worked hard at school to get in to medical college and hard at medical college to become a doctor. I made sacrifices and I earned my position as one of the hospital’s senior practitioners; trusted and rewarded as more than a safe pair of hands. In these days of targets and audits my published mortality rate is comparable with that of anyone in the country. We all undertake private practice, but I retained and honoured my commitment to the National Health Service, and believed wholeheartedly that medicine should always be free at the point of delivery. I don’t honestly know what I believe now; about anything. person, a classic tale of vengeance and obsession unfolds. It has the feel of truth, but the resonance of a mad and desperate endeavour. 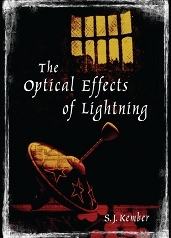 In thrall to the transformative power of lightning, this quest, which comes to us in the form of a meticulously ordered case file, questions the divide between magic and reason, monstrosity and humanity. When Matt discovers the disappearance of his lover Suhail, he realizes Suhail has gone in search of his brother Saeed. Suhail blames himself for a horrific childhood accident in which Saeed's face was disfigured during a lightning storm. He comes to believe that just as lightning separated them when they were young, so it can join them again, bringing them back together as one being – fused, reprogrammed and restarted. While Matt urges the police to find him, Suhail seeks a reunion with his brother that may redeem – or condemn him.